It’s been said by enough smart people that we should start listening. Religion and science aren’t at war. This morning, a recent story about science and abortion suggests a new analogy for understanding the role science has always played in our hundred-years’ culture war. It has more to do with Jackie Chan and Bruce Willis than Galileo and John Scopes. SAGLRROILYBYGTH won’t be surprised to hear it. Historians like Ronald Numbers and sociologists like Elaine Howard Ecklund have long since punctured the tired old myth that religion and science have always been on opposite sides of our culture-war trenches. The old story is that religious conservatives fear and loathe science. They insist—the myth says—on anti-scientific ideas about a young earth because they don’t like science. They fight against scientific progress using stem cells because they prefer God to knowledge. They put their heads in the sand and bat science away with a swat of their annotated Bibles. are actually significantly more likely than the general population and significantly more likely than any other religious group to see religion and science as having a collaborative relationship. New technology makes it easier to apprehend the humanity of a growing child and imagine a fetus as a creature with moral status. Over the last several decades, pro-life leaders have increasingly recognized this and rallied the power of scientific evidence to promote their cause. They have built new institutions to produce, track, and distribute scientifically crafted information on abortion. They hungrily follow new research in embryology. They celebrate progress in neonatology as a means to save young lives. Nor is this conservative religious fondness for science new. As I argued in my book about educational conservatism, in the 1920s anti-evolution leaders counted on mainstream science to disprove Darwin’s ideas about natural selection. At the Scopes Trial, for instance, proto-creationist William Jennings Bryan assumed he could put leading scientists on the stand to disprove the atheistic pretensions of false evolutionary science. It was only when Bryan couldn’t find credentialed scientists (except for one impressive gynecologist) willing to take his side that he decided to fight against the use of expert scientific testimony. Today’s pro-life activists are on the other side. They’re finding proof for their claims from mainstream science, and they’re thrilled. These conservative religious activists don’t fear science. They don’t loathe science. Rather, they desperately want to use science to prove themselves right. Science is only bad when it seems to go against them. To our ILYBYGTH eyes, this situation suggests the need for a new way of thinking about the culture-war relationship between science and religion. They are not at war. We don’t see religious conservatives fighting against science. Rather, we see both sides eagerly glomming on to any science-y sounding proof of their position. So here’s my humble suggestion for a better way of imagining the real relationship: Science is like the gun in the big fight at the end of action movies. Hear me out: In any decent action flick, the final fight between the hero and the main villain takes a ridiculously long time. Each combatant will sustain enough blows to fell a charging rhino, yet they continue to battle. In a lot of the good fights, one or the other of the combatants will pull out a gun at some point. He or she smugly thinks the fight is over, but the gun will inevitably be batted away. As the fight progresses, both combatants desperately strive to reclaim the gun, to end the fight once and for all. The way I see it, science is the gun. Both sides want it. Both sides recognize its power. Both sides hope that they can use it to end this too-long conflict by seizing it and using it against the other side. The gun is only bad when the other guy has it. From abortion to creation to sexuality, everyone wants to claim that science is on their side, no matter what that side is. A devilish Jewish conspiracy? A beloved Christian import? Recent news from Turkey builds on the surprising evolution of creationism in that country. That’s not the surprising part. After all, even when Turkish official textbooks did discuss evolution, they were hardly fair, balanced, or free of religious bigotry. According to The Financial Times, earlier Turkish textbooks warned students that Darwin “had two problems: first he was a Jew; second, he hated his prominent forehead, big nose and misshapen teeth.” The books mocked Darwin’s lack of formal education, noting strangely that he preferred to spend his time with monkeys in the zoo. For a while, then, Turkey’s public schools have catered to popular bigotry about evolutionary ideas. Turkey is hardly alone. Evolution is deeply unpopular in many Muslim-majority countries. According to Salman Hameed of Hampshire College, fewer than a fifth of Indonesians, Malaysians, and Pakistanis say they think evolution is true. Only eight percent of Egyptians do. Turkey is no exception. Just as in the United States, evolutionary theory is widely denounced, even if it is not widely understood. Anxious leaders curry favor with conservative religious populations by throwing Darwin under the bus. It is not news, then, that Turkey’s government is trying to win support among religious voters by eliminating evolution from textbooks. We might be surprised, however, by the history of cross-creationist connections that have long linked Turkey’s Islamic creationists to San Diego’s Christian ones. As historian Ronald Numbers described in The Creationists, in the mid-1980s the minister of education in Turkey wrote to the San-Diego based Institute for Creation Research. Turkey’s schools, the minister wrote, needed to “eliminate the secular-based, evolution-only teaching dominant in their schools and replace it with a curriculum teaching the two models, evolution and creation, fairly” (pg. 421). The relationship between powerful Turkish creationists and American creationists thrived. In 1992, a Turkish creationism conference invited ICR stalwarts Duane Gish and John Morris as keynote speakers. Professor Numbers also describes the founding in 1990 of the Turkish Science Research Foundation (Bilim Arastirma Vakfi, or BAV). In Numbers’ words, “For years BAV maintained a cozy relationship with Christian young-earth creationists, feting them at conferences, translating their books, and carrying their message to the Islamic world” (pg. 425). However, Numbers concluded, “the partnership between the equally uncompromising Christian and Muslim fundamentalists remained understandably unstable” (425). Numbers cited the rhetoric of American creationist leader Henry Morris: “Mohammed is dead and Jesus is alive!” As Numbers noted acerbically, such talk was “hardly calculated to win Muslim friends” (425). It’s not shocking, then, that Turkish and American creationists keep one another at arm’s length, in spite of American outreach to Turkey and lavish and expensive efforts by Turkish creationists to woo American scientists. Here’s the last question: Will Turkey’s recent move finally convince pundits to stop saying that the United States is the only country in which creationism thrives? Will creationism finally be seen as the world-wide conservative impulse that it really is? Do I Need to See the Light? Joel Carpenter is. Mark Noll is. George Marsden is. Ron Numbers is was. John Turner is. John Fea is. I’m not. Does it matter? Many of the best academic historians of evangelicalism and fundamentalism grew up as part of an evangelical church. Indeed, among academic historians in general, since the 1960s it has been seen as a big plus to have a personal background with the group(s) we study. It’s not universal. As far as I know, Matthew Sutton didn’t. Molly Worthen didn’t. Tanya Luhrmann didn’t. And if they did, it is not a big part of their public persona. In other words, they write as scholars of evangelical religion, not necessarily as evangelical scholars of evangelical religion. This is more than just “PC” cliquishness. Historians are sobered and humbled by their own history. Though African American historian WEB DuBois clearly debunked the dominant but false histories of Reconstruction way back in the 1930s, white historians didn’t catch up until the 1960s. With fundamentalism in particular, non-evangelical historians did a terrible job. Until the 1970s, mainstream historians told us that fundamentalism died after the Scopes Trial of 1925. It had done nothing of the sort, of course. A new generation of evangelical historians such as Ernest Sandeen and George Marsden knew it hadn’t, since they had grown up with it. Having a background in the world of conservative evangelicalism gives historians an ear for the language and a feel for the connections between groups. When I was stumbling through my graduate work at Wisconsin, for example, my mentor Ron Numbers was able to point me toward super-rare creationist documents from the 1930s. How did he know about them? They were written by his grandfather! That sort of connection is something we outsiders can never acquire. As outsiders, though, we non-evangelical historians enjoy some benefits. For us, there are no pre-existing good guys or bad guys. We aren’t embarrassed by the rhetorical excesses of 1920s fundamentalists. They don’t have anything to do with us! We don’t feel a need to demonstrate how different such hellfire preachers are from our own intellectual roots. To us, it’s all archival material. In short, evangelical historians will always have insights I lack. But they will also have hang-ups and assumptions I’m free from. Recent discussions on this blog have pointed out the continuing importance of these questions. When I noted the recent visit of Bob Jones University President Steven Pettit to the scenic campus of Wheaton College, I was mostly interested in the turbulent historical relationship between the two schools. At least one commentator, however, accused me of trading in “guesswork and gossip.” I didn’t mean to suggest that BJU was somehow “moving toward neo-evangelicalism.” Many readers within the world of fundamentalism and evangelicalism have very strong feelings about such things. I don’t. As I plow forward with my new book about conservative evangelical colleges and universities, I need to keep these issues in mind. I need to remind myself that I might be missing out on subtleties of tone or implication that are obvious to those raised within this tradition. I need to watch for connections that are not made explicit to outsiders, but are nevertheless glaringly obvious to those in the know. How old is the planet? For some creationists, it may seem like an ancient bit of Christian orthodoxy that God created the whole thing less than ten thousand years ago. But we see more proof today that the idea of a young earth is a relatively novel idea among conservative Christians. Anyone who has done their homework knows the story. As historian Ronald L. Numbers outlined in his definitive book The Creationists, most conservative Christians believed in an ancient earth until the 1960s. Even in the hottest days of anti-evolution controversy in the 1920s, fundamentalist leaders usually felt no need to believe in a young earth. As I make my way through Bradley Gundlach’s excellent book Process & Providence, I came across a similar example from the 1800s. Back then, Princeton Seminary was the redoubt of thinking creationists. In 1856, the school’s journal offered a short review of a new book by David N. Lord, Geognosy, or the Facts and Principles of Geology against Theories. In his long book, Lord argued that mid-nineteenth-century geologists often missed the boat. Such foolish pseudo-scientists, Lord wrote, mistook the boundaries of their own science and slid into both scientific and theological error when they suggested that the earth must have existed for millions of years. Today’s conservative creationists might think that any self-respecting creationist would applaud Lord’s work. And the guardians of orthodoxy at Princeton did, to an extent. They described Lord’s goal as “elevated and holy.” His conclusions, however, did not sit well with the Old Princetonians. 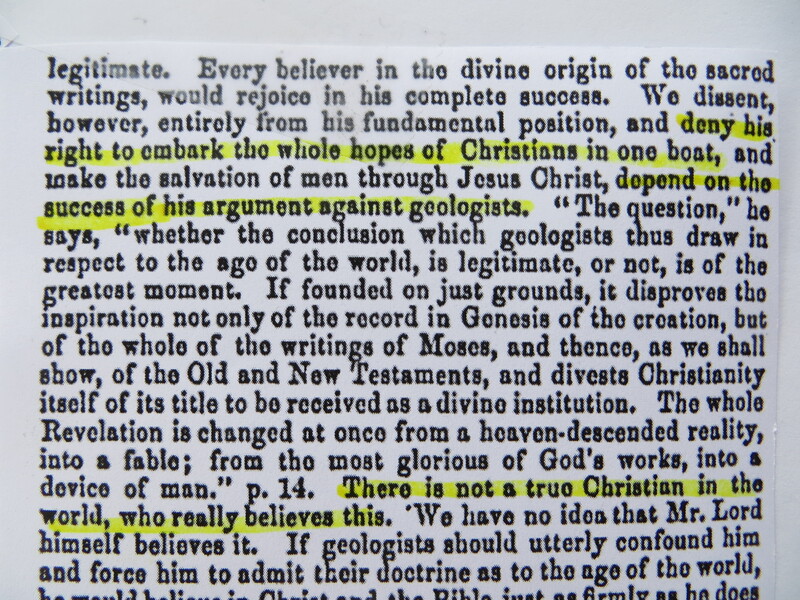 In a way that might be surprising to today’s young-earth creationist crowd, the theologians at Princeton assailed Lord’s attempt to defend Scripture by attacking emerging geological science. Why? Not because they doubted the inerrant nature of the Bible. No, the Princetonians instead refused to allow their religion to be bound and hampered by any possible scientific discovery. Fundamental position, and deny his right to embark the whole hopes of Christians in one boat, and make the salvation of men through Jesus Christ, depend on the success of his argument against geologists. 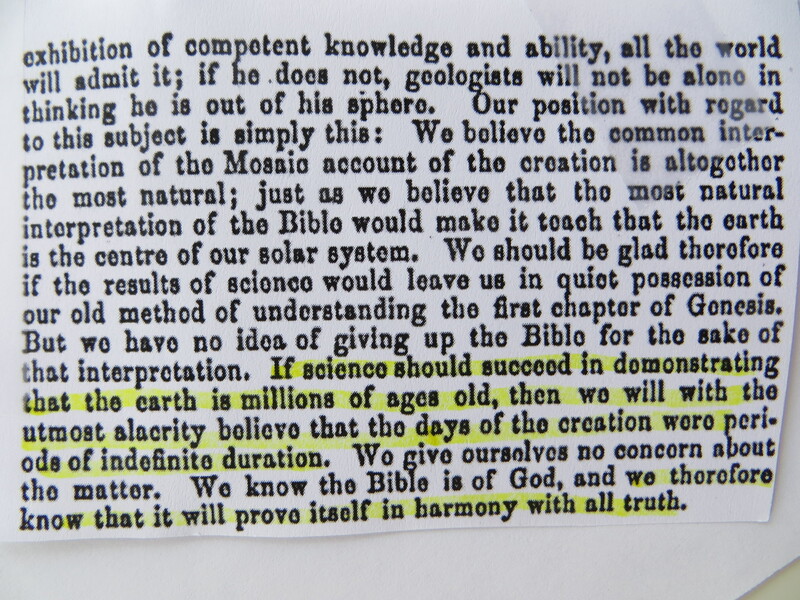 Should succeed in demonstrating that the earth is millions of ages old, then we will with the utmost alacrity believe that the days of the creation were periods of indefinite duration. How powerful is creationism worldwide? Some pundits have suggested that creationism is unique to the USA. But recent news from Brazil indicates that global creationism may be gaining steam. Is it? Some science pundits, such as Bill Nye, contend that this sort of creationism is “unique” to the United States. In this case, The Science Guy is flat-out wrong. Creationism—even if we limit it to just the Christian kind—is a global phenomenon. And the reasons for that globalism matter. Pundits like Bill Nye might assume that creationism thrives in those corners of the globe that have not yet been incorporated into the global conversation. In some isolated regions, this theory goes, the obvious truths of evolution have not yet penetrated. But that explanation gets it backward. The reason for thriving creationism in Brazil is not due to ineffective science education. It is due, rather, to explosively effective religious education. That is, Brazilian creationists are not simply religious primitives who have been isolated from the gospel of evolution. Instead, they are religious innovators who have been connected to a global gospel of creationism. Throughout the twentieth century, conservative evangelical Protestants have successfully spread their religion throughout Latin America, finding a particularly congenial home in Brazil. As a recent study from the Pew Research Center for Religion & Public Life makes clear, US-style evangelicalism has aggressively moved into Brazil, courting the country’s Catholics and converting them in large numbers. For a hundred years, evangelical groups have spread via missionary organizations into Brazil. As Andrew Chestnut of Virginia Commonwealth University explains, groups such as the Assemblies of God have been particularly successful in Brazil. With this Pentecostal denomination, at least, Brazilian locals have taken over and made it their own. And they are now asserting their power politically. For instance, the author of the recent creationist legislation, Marco Feliciano, is an Assemblies of God pastor. And he insists that Brazilians are on his side. Poll numbers back him up. According to the NCSE report, fully 89% of Brazilian respondents think creationism should be taught in Brazil’s public schools. Nearly that many, 75%, think ONLY creationism should be taught. I’ve argued in the past that evolution educators often have a missionary zeal to spread the truth about evolution. This news from Brazil suggests that evolution’s missionaries are just not as good as the creationist types. Ken Ham, creationist debater extraordinaire, has again thrown down the gauntlet. This time, Ham has challenged conservative evangelist Pat Robertson. More than watching Ham battle Science Guy Bill Nye, America needs to hear this debate between conservative evangelical Protestant creationists. I wonder if Pat Robertson would be prepared to discuss these issues with me or one of our AiG scientists on the 700 Club? Or maybe in some sort of debate format at Regent University? We are certainly willing to do that…. I wonder if Pat Robertson, who is allowed to state these things so publicly through CBN will agree to have his statements publicly challenged and tested! Both conservative religious folks and outsiders like me would benefit from such a debate. We outsiders would learn more about the issues that matter to creationists. None of us were particularly surprised by the arguments Bill Nye put forward. But many of us would be enlightened to hear the reasons for and against belief in a young earth, since both sides would be arguing from a relatively similar religious perspective. We outsiders could learn about the kaleidoscopic world of creationism. For some people, this might be the first time they heard that not every creationist embraces the idea of a young earth. And evangelicals would benefit enormously. After all, belief in a young-earth as creationist orthodoxy is a very recent phenomenon. As historian Ron Numbers demonstrated so powerfully, until the second half of the twentieth century, belief in a young earth was restricted to a relatively small percentage of conservative evangelicals. At the time of the Scopes trial in 1925, for example, leading fundamentalists differed in their beliefs about the age of the earth. At that time, no one looked askance at anti-evolutionist leaders such as William Jennings Bryan who believed in an ancient earth. Only with the publication of Henry Morris’ and John Whitcomb’s creationist blockbuster The Genesis Flood did young-earth creationism become a dominant theme in conservative American evangelical thought. Many young evangelicals these days don’t know this history. They often assume they must either accept the doctrine of a young earth or abandon their religion entirely. A debate between two conservative evangelical leaders would demonstrate the possibilities. What’s on your shelf? 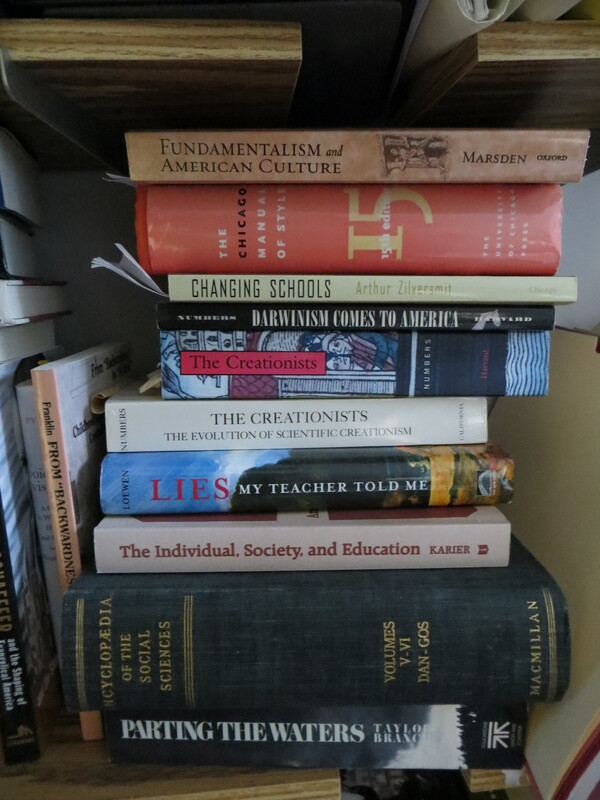 What do you read to help you figure out questions about conservatism and American education? I Love You But You’re Going to Hell is happy to introduce a new feature: Shelfies. Readers are invited to send pictures of their bookshelves with annotations. You can send them to the editor: alaats@binghamton.edu Make sure the titles are legible. 1.) George Marsden’s Fundamentalism & American Culture. It was this book (in an earlier edition) that first got me interested in the culture and activism of conservative evangelical Protestants. 2.) Arthur Zilversmit’s Changing Schools. I refer to this book regularly. 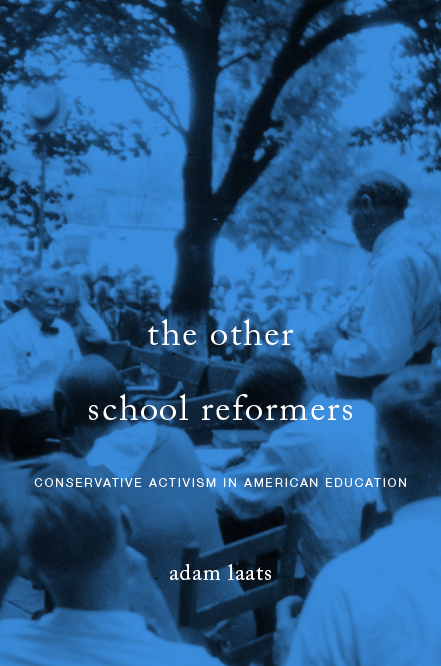 It looks at the slippery nature of “progressivism” in American schools in the crucial period of 1930-1960. 3, 4, & 5.) The Ron Numbers Collection: Ron was my mentor in grad school at Wisconsin. His work on creationism has been the bedrock reference for my historical research. 6.) James Loewen, Lies My Teacher Told Me. I use this book regularly with my students who are going into history education. Loewen’s tone is always a little too strident for my tastes, but this book is always good for those who are thinking about teaching history for a living. 7.) Clarence Karier, The Individual, Society, and Education. This is a good book. Not enough people seem to read it these days. Karier looks somewhat idiosyncratically at the long history of education in the United States. 8.) Encyclopedia of the Social Sciences, 1935. In this volume, historian Richard Niebuhr (brother of theologian Reinhold) offers an early and skewed definition of “fundamentalism.” Niebuhr concluded, without much evidence, that fundamentalism was a rural phenomenon, an outgrowth of ignorance and isolation. Though this definition doesn’t match the historical record, it proved enormously influential. For decades, non-evangelical scholars accepted Niebuhr’s slanted definition without demur. 9.) Taylor Branch’s Parting the Waters. This well-known civil-rights history is there because I needed something to cover the gap in my bookshelves. I can’t say I’ve ever read it, though I’ve always meant to. So how bout it? Send in some shelfies, tell us about what you’re reading.